Manila, Philippines - Team Lea's young artists continued "The Voice Kids" Philippines Battle Rounds on Sunday, June 29, 2014. It was a battle of vocals between Kobe Viray, Lorenzo Cinco and Shanne Dandan as they performed Train's song 'Hey, Soul Sister'. Coach Sarah chose Shanne while Bamboo chose Kobe. 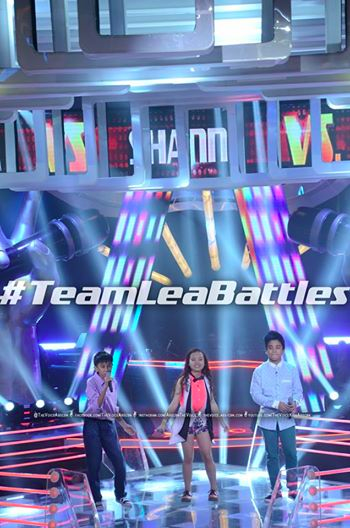 Coach Lea picked Shanne as the winner in the three-way battles. She will advance to the next round of the competition – the Sing-Offs. WATCH: The Voice Kids Philippines Battle Round: Kobe vs Lorenzo vs Shanne sing "Hey, Soul Sister" (video). After the Battles, vocal showdown of Team Lea's top 6 artists will be featured in the Sing-Offs, which will cut down the team to its Final 2 artists.